Tree has built-in support for internal/external drag-and-drop. There is a one more special drag-and-drop mode - 'order'. It works like the "move" mode, but items can't be dragged out of the tree container boundaries. Also, while dragging an item the remaining items are automatically rearranged, so that when you drop the item to the final destination the remaining items won't need any rearrangements. To enable the drag-n-drop support and activate the 'order' mode, just set the drag parameter to order. When you have several trees on the page, you may want to set specific tree(s) as the source of drag-n-drop (to drag items from) and specific tree(s) as the target of drag-n-drop (to drag items to). To set a tree as the drag-n-drop source (the user can drag items from the tree but can't drag to it), you should set the drag parameter to source. //you can drag items only from treeA to treeB. //Dragging within treeA is denied. Dragging from treeB to treeA is denied. Information stated in the Common part is enough in most cases. The current part should be used just if you want to customize existing drag-and-drop behavior. Related events and the order in which these events are invoked. The desired template is set through the context.html property. You can use any HTML while specifying the value for the property. To deny dragging specific items you can use the onBeforeDrag event and return false each time you want to block the operation. From now on, each time d-n-d is started, the item level will be checked, and the item can be dragged only if its level equal to 2. To specify custom behavior for the 'drop' operation you can use the onBeforeDrop event. 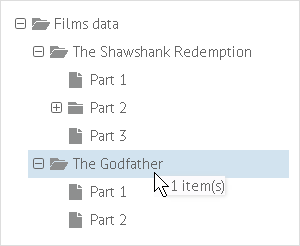 When you drag item(s) to the opened folder, the item is inserted as a child. In the default scenario there is no need to use any of the mentioned events, because Tree will process all the operations on its own. Use the events only when the default behavior needs customizing. Let's assume you have 2 same trees and drag an item from the 1st tree to the second one. Returning 'false' from the event handler will block the current drag-n-drop operation. onBeforeDragIn / onDragOut fire in tree1 as you drag the item within the tree1's container. Returning 'false' from the event handler will deny dropping to the related tree. onBeforeDragIn / onDragOut fire in tree2 as you drag the item within the tree2's container.